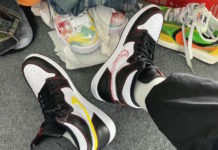 The latest “Bred” Air Jordan 1 to releases comes in the form of the mid-top rendition of the popular silhouette that even includes classic heel logos. This Air Jordan 1 Mid features a Black leather and rubber mesh upper with a Black patent leather Nike Swoosh on the sides. University Red accents covers the tongue, insole, Wings logo, classic “Air Jordan” branding on the heels, and translucent outsole. White appears on the “AIR” branding of the tongues as well as used on the midsole. You can now find the Air Jordan 1 Mid “Bred” available at select Jordan Brand retailers such as Foot Locker. The retail price tag is set at $120 USD.